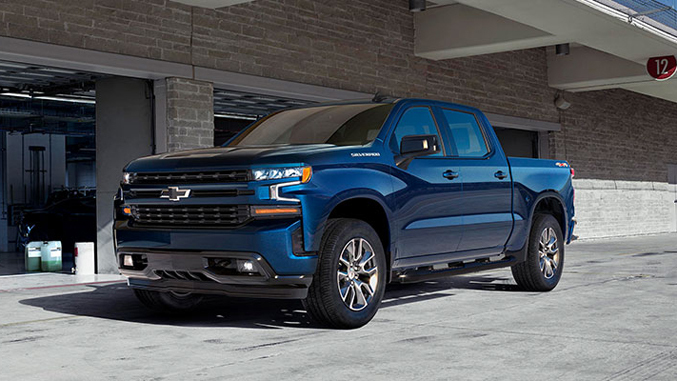 Chevrolet has debuted their much-anticipated 2019, GMT T1XX-platform Silverado, and has continued their proven recipe: offer a massive amount of trims with a massive amount of options and capture as many repeats and potentially-new customers as possible. As long as no reliability issues come up along the way, they can count on printing money with this recipe. Despite the previous generation being around for just about 5 years, there is a substantial amount of changes to warrant this new generation. With revised styling, some intuitive engine technology, an increased amount of overall technology, and fuel economy that rivals mid-2000s sedans, this is sure to be another great chapter in the Silverado’s history. The model we tested, as we found it to be a good mid-level, full-size truck that would cater to racers quite well, is the 2019 Silverado 2WD RST Crew All-Star Edition. It came equipped with the 5.3-liter Ecotec V-8, trailer brake controller, and 20-inch painted alloys as options. Pricing comes in right around $47,000 for this spec, whereas the base Silverado RST starts around $39,000, and the absolute-most-base Silverado WT comes in just shy of $38,000. The model we would certainly love to get our hands on in the future is the Custom Trail Boss; all of the specs point to it being fast and a ton of fun. The Silverado we tested came equipped with GM’s all-aluminum 5.3-liter Ecotec3 V-8 (that’s right, even V-8s are being marketed as “Eco” in today’s market) with Dynamic Fuel Management and an 8-speed automatic transmission. Power figures come in at 355 horsepower and 383 pound-feet of torque, which certainly felt ample around town having a little modest fun at stoplights. While we didn’t get the chance to bury the gas pedal to accelerate onto the highway, or cruise along at an easy highway pace, the EPA rating of 19 MPG in mixed driving certainly felt attainable. Chevy has been actively marketing the new Silverado as “sporty”, and it certainly shows in the Silverado’s interior and driving characteristics. First and foremost, our Silverado was equipped with 5 selectable drive-modes: Tour, Sport, Tow/Haul, Terrain, and Snow/Ice. Cruising around in Tour felt just fine for scooting along in everyday driving, while Sport made acceleration just a tad bit sharper and kept the RPMs just a tad bit higher. The 5.3-liter V-8 felt athletic and quick to rev, unlike the large, low compression, lumbering truck V-8s of yesteryear. It’s 11.0:1 compression ratio certainly indicates this as well. As far as burying the throttle and getting going, we had no qualms with how the 8-speed transmission shifted. It didn’t take long to find and select the necessary gear, and even with Dynamic Fuel Management on, there wasn’t any real sense of lag while driving. Dynamic Fuel Management is Chevy's system that turns cylinders on-and-off depending on if they're needed. Per the current government fuel and emissions regulations, this truck was equipped with an automatic start/stop, which didn’t really inhibit driving along either. Though if it’s something a driver is absolutely opposed to, it is easily defeatable via an actual button, rather than a setting buried in the command center. While the vehicle we tested was not equipped with this, this is the first generation to come with a 2.7-liter turbocharged 4-cylinder engine, cranking out 310 horsepower and 348 pound-feet of torque; quite impressive and definitely a strong competitor to Ford’s 2.7-liter EcoBoost 4-cylinder found in the F-150 and Ranger. The Silverado rode quite nicely for a full-size pickup truck. It felt solid and planted, though compliant and comfortable. It also did not feel as perched-up as taller full-size pickup trucks often feel. Making slightly-spirited turns down suburban streets was easy and minimal body roll was exhibited. Over undulations in the road and railroad tracks, we certainly noticed the long truck body (though this was a “short box” model) porpoise and dive a tad, but this is to be expected of a full-size. The steering was light but surprisingly communicative; perhaps this is due to Chevy injecting a little more sportiness in this generation. Combine all of these characteristics, and the truck feels much lighter on its feet and athletic compared to other full-size trucks we’ve driven. It doesn’t feel like a 4,800-or-so-pound full-size truck, perhaps that is due to a brand new re-designed frame, which is fully boxed and has 10 percent greater torsional rigidity over the previous generation. 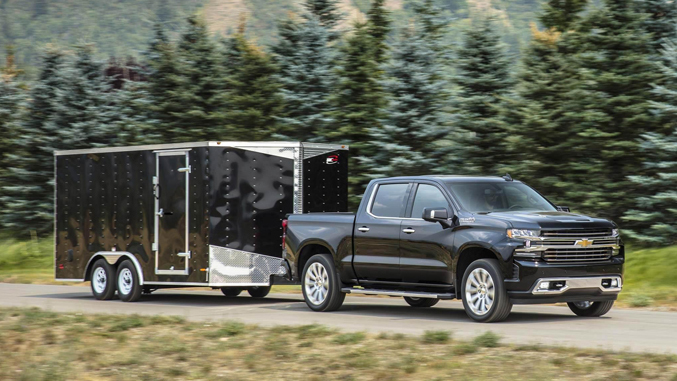 Towing is rated at 11,600 pounds, with a locking rear differential, external engine oil cooler, transmission oil cooler, trailer brake controller, and intuitive rear camera included in the package we tested. This chassis can certainly handle most weekend racers’ demands with ease. Added to this ease is the ability to test the trailer lights via the myChevrolet mobile app; what a time to be alive. Our Silverado was equipped with the All-Star Edition package, which gave it a heated steering wheel, heated front seats, a 10-way adjustable driver seat, and dual-zone climate control. Not the most necessary package for Southern California racers, but most likely a big sigh of relief for any racers in colder climates in the late Fall and early Spring. The cloth seats were very comfortable and had nice bolstering, and head and leg room were superb. The Silverado definitely has a long-haul-friendly interior. Backseat space was generous, and the center armrest folds up to a surprisingly spacious middle-front seat; quite reminiscent of an old Chevy C/K truck’s front bench. The amount and size of storage compartments was quite generous as well; we already have enough trouble losing 10 millimeter sockets, allen keys, etc., the Silverado might actually be a part of the problem in this department. The command center was controlled by touch screen but was very receptive and easy to navigate. There were still push-buttons for the climate controls, thankfully. This trim came with a standard array of tech, including 4G LTE capability, and an intuitive backup camera with great visibility and excellent reference points for distances. The brand new 2019 Silverado is sure to be a hit and maintain its status as an American institution. With a long pedigree of building tough, reliable pickups, and a knack for targeting all corners of the market with customization, Folks have commented on the new generation's front grille not being the most handsome, but we rather like it, especially on the Trail Boss. Chevy surely will not disappoint as this generation progresses. We’re certainly excited to see what additional packages become available in the future. 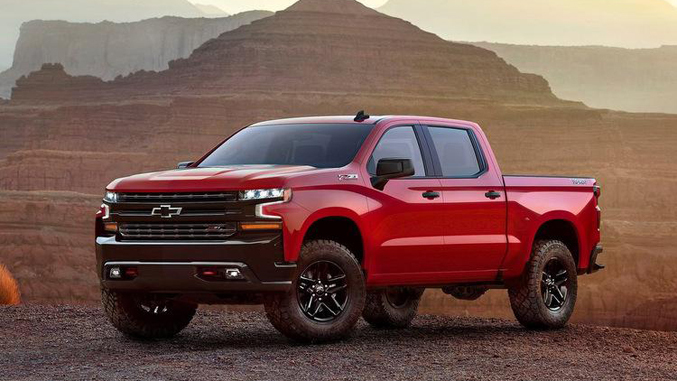 It’s safe to say they will always stay true to their roots; from the Trail Boss trim coming equipped with the fan-favorite Z71 Off-Road Package, to the gauge font not changing since the first Silverado debuted in 2000.